After Google I/O, we at GDG Philippines have been busy with our events. We've had the Post-I/O Meetup (July 7), Chromecast/Google Cast Meetup (July 23), Polymer Workshop (July 30) and Android Wear Workshop (August 2). GDG Philippines also visited different schools (FEU, ADMU, and NU) for our GDG Campus Roadshow events. Aside from talks about different Google technologies, we usually have Android, Google App Engine, or Google Maps API workshops for our Campus Roadshows. 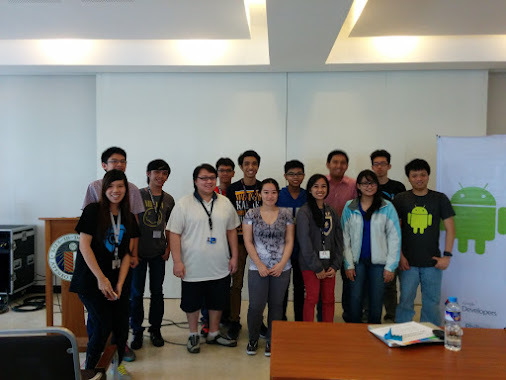 In Ateneo de Manila University (July 26), we had workshops in Google App Engine and Android. This was co-organized with a Google Student Ambassador from Ateneo (Cristine Chen). I facilitated the morning Android workshop. 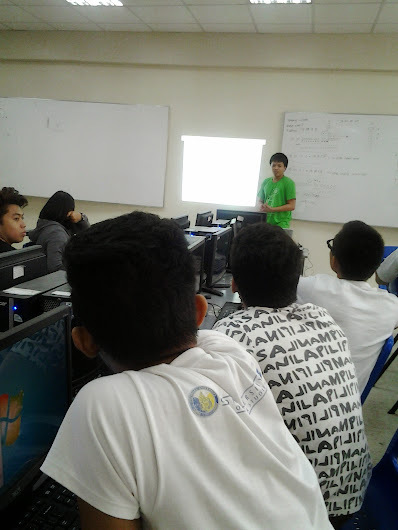 During the GDG Campus Roadshow in National University, we had talks about Google Chrome, Google Apps, and Motivational/IT Careers. 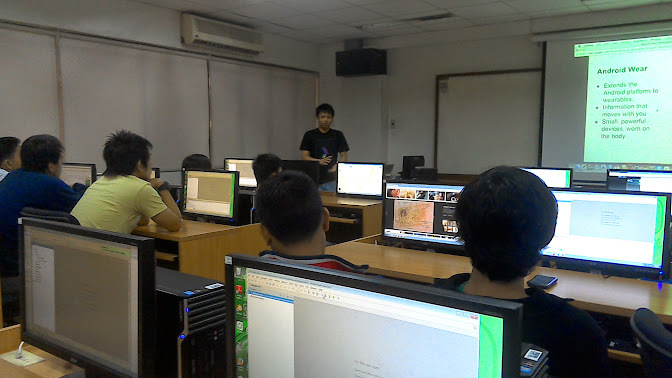 In the afternoon, we had workshops in Google App Engine, HTML5 Game Development, and Android. I facilitated the half-day Android workshop. We also organized our first Android Wear event, an Android Wear Workshop last August 2. It was a whole-day event held in De La Salle University. Tomorrow, we'll be back in DLSU for the GDG-GSA Campus Roadshow, with Google App Engine workshop in the morning and an afternoon Android Workshop. Conducting workshops, even if it's just a half-day event, is tiring but knowing that you have taught the participants something and inspired them takes away all the tiredness. If you are interested in attending events of GDG Philippines, add us in your Google+ circles for updates. You can also invite GDG Philippines in your schools by filling up our Event Request Form and we'll get back to you. Additionally, you can download the packages for Samples and Sources. 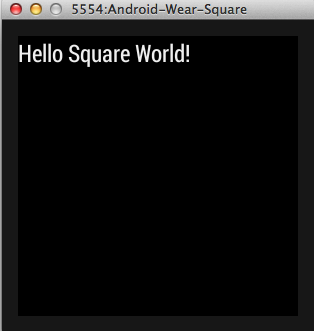 Click OK. You can now start this emulator. Click New Project in the Welcome Screen (or File > New Project if you already have an open project). Fill up the project name and package name, then click the Next button. 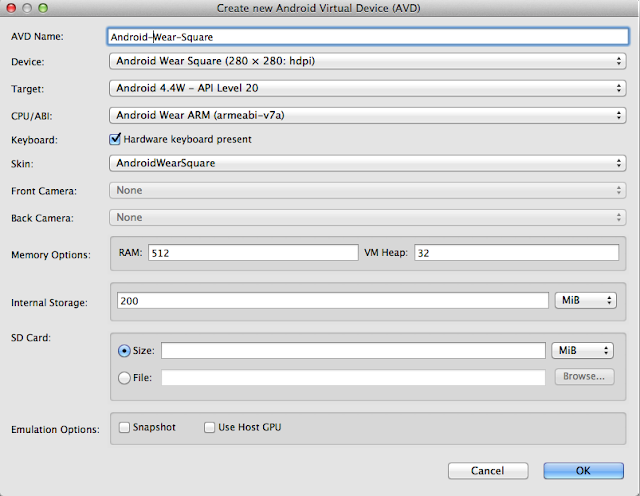 Check Phone and Tablet and select the Minimum SDK. In the Add activity to Mobile window, select Blank Activity then click the Next button. You can change the activity name, layout name, and title. In the Add activity to Wear window, select Blank Activity then click the Next button. You can change the activity name, and the layout names. During Google I/O 2014's keynote, Android Wear was officially announced. Android Wear extends the Android platform to wearables. To use an Android Wear smart watch, it must be paired to a phone or tablet running Android 4.3 and up and has Bluetooth. The Android Wear app must be installed and used to pair the handheld device to an Android wear device (or an Android Wear emulator). There were three smartwatches announced: the LG G Watch and Samsung Gear Live, which are already available for purchase and the upcoming Moto 360, which will be released in the coming weeks. Both the LG and Samsung watches have square faces while the Moto 360 has a round design. Android Wear shows your Google Now cards and notifications from the apps installed in your handheld device. There are also apps that has integration to or run directly on the wearable. You can also use the Ok Google voice command to search, reply via voice, or do actions on the wearables (like Take a Note, Send a text, Navigate, and many more. It can also count your number of steps and get your heart rate (the Gear Live has this sensor while the G Watch does not). One of the things announced during Google I/O 2014 was the Android L Developer Preview. It is an early access of the upcoming new version of Android, which is targeted for developers who want to make their apps ready when it launches soon. The new features of the Android L Developer Preview include Material Design, the new default runtime ART (Android Runtime) to replace Dalvik, Enhanced Notifications, Project Volta (battery and energy efficiency), and a lot of new APIs. To try Android L Developer Preview, go to http://developer.android.com/preview/setup-sdk.html. For now, only Nexus 5 and Nexus 7 2013 edition has available system images. If you encounter bugs or have some feedback, you can summit it in the issue tracker at https://code.google.com/p/android-developer-preview/. You can also join the Android L Developer Preview Google+ community.